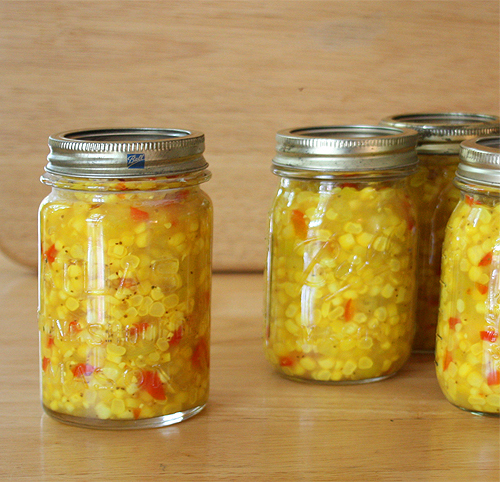 Tangy and sweet this homemade corn relish is a go-to item in my pantry. 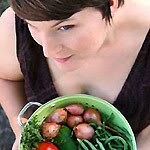 It has been incorporated into many meals over the last year. My favorite use was to add a couple dollops to sour cream and enjoy it as salad dressing. I've also put it on burgers and mixed it into chicken salad. It was delicious with Thanksgiving turkey. Not only does this corn relish bring a burst of texture and flavor, it adds gorgeous color. The turmeric deepens the sweet corn to a lovely gold, add in the red flecks from the bell pepper, and you've got a beautiful spoonful. I plucked this recipe out of the July 2010 Better Homes and Gardens. I made it because I thought it was pretty and since I had green pickles and red tomato sauce I thought it would add another color to my cabinet. I didn't really care if it tasted good. I have no idea what blue ribbon it won, but I can see why it won. It is both pretty and tasty. The only thing I changed was to reduce the amount of celery seeds from two teaspoons to just one because they were over powering. I'm not a big celery fan. I made this recipe last year, but I wasn't sure if I liked it so I didn't share it with you all. Now I am sure. This relish will liven up your meals as a topping or a mix-in. Shuck the corn and make sure you get all the silk off the ears. Cut the corn off the cobs, do not scrape the cobs. Measure 8 cups of corn and put them in a sauce pan with 2 cups of water. Bring to a boil; reduce heat and simmer, covered for 5 minutes or until the corn is almost tender. Drain the water off. Meanwhile, prepare jars by sterilizing them. Ladle the hot relish into jars. Leave a half inch head space. Wipe the jar rims with a clean towel and top with lids and bands. Process filled jars in a boiling-water canner for 15 minutes. Start timing when the water returns to a boil. Remove jars; cool on wire racks and then store in a cool, dark place. Refrigerate after opening. How would you use this delicious corn relish? That looks great!! Love the colors. Oh, this does look tasty and I bet it would be great on a number of dishes! That does look tasty. Thanks for sharing. I had to laugh because you sound like me. I'd add something to my pantry because I thought it would look pretty, not because I cared if I would like it. This sounds great, I pinned this one! Oh, I bet this is AMAZING! I can see why it won a ribbon and your jars are stunning! I would put this on just about anything! Not a celery fan?? I don't think I've ever met a non-celery person. Whether it has one or two teaspoons of it though, the relish is gorgeous; you're right. It's too bad that our corn is months gone. I'll have to wait until next year. I will hold on to this recipe for next year. Sure looks good. Thanks for sharing. Boy does that look good. I have a jar of Rick's Picks Corn Relish in the refrigerator that I have to use up and then I am going to make some of this. Looks amazing. I love serving it on hot dogs. I buy corn relish at the Amish Farmers Market. At home, I put a small scoop of corn relish on my plate next to a green salad and some cottage cheese and apple butter! I like the sweet/sour combination. Actually, I won a blue ribbon with this recipe, at my local county fair. And I made more of it to give to my brother at Christmas, since he loved it so much. Thanks for sharing this over at Fill Those Jars Friday! I've never tried corn relish. It looks great! I make this all the time, using store-bought frozen corn. It's yummy! Almost as good as using fresh! I just love celery seed. For canning, you are not supposed to use cornstarch, though. The updated version contains Clearjel (or Clear Gel). Looks like a lot of sugar. Is it requited for preservation or can one omit? Apple Corn Chutney: Reduce corn to 6 cups and add 2 cups chopped Granny Smith apples. Omit celery seed and turmeric and replace with 2 tsp. caraway seed. Cumin-Pablano Corn Relish: Use 1 1/2 cups chopped Pablano peppers in place of the chopped green sweet pepper. Reduce vinegar to 2 cups and add 1/2 cup lime juice. Omit celery seeds and turmeric and replace with 2 tablespoons ground cumin. Corn Olive Relish: Add 2 cups coarsely chopped pitted green, black and/or kalamata olives with the celery.